I was very pleased with the reception I received from the staff. Welcoming and friendly. I thought there was a good mix of what’s possible and miracles do not happen overnight. The explanation of how my progress is tracked gave me a lot of confidence that reality will be part of my team. I know what it’s like to sell something I really believe in Dr. Savage clearly believes in his practice. This could be my most favorite place on the planet! I loved Great American when I was between the ages of 6-14, but I am positive that this could be my overall most favorite place on the planet, although swimming in Hawaii is cool, but Hawaii is in a strong second place to Chiropractic First. The staff is so friendly, outgoing, open, and concerned with the patients overall health, that the patient feels genuine care when they walk in the door. It’s Sunday and I wish you were open! I have been in a state of pain, discomfort and loss of certain normal body functions for so many years that I had accepted that this was now what I had to deal with. This is the first time in 7 years I believe that I am on the right path, and that the doctors at Chiropractic First are on that path with me. I am on an intense treatment plan because of all of the years of chronic abuse to my body (extreme exercise, coupled with neglected injuries) and I do feel like I will get so much better here! Matt and I are very active people. I love gymnastics and Matt is an avid baseball player. Our athletic lives were being impaired by pain. I suffered from neck and lower back pain, and Matt experienced troublesome muscle soreness. 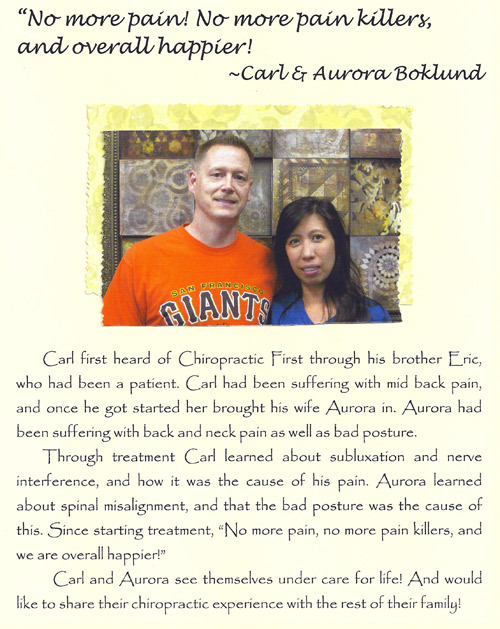 We came to Chiropractic First seeking solutions, and were not disappointed. We learned that the source of our pain was spinal subluxations. Upon completing our course of treatment, we were both pain free. 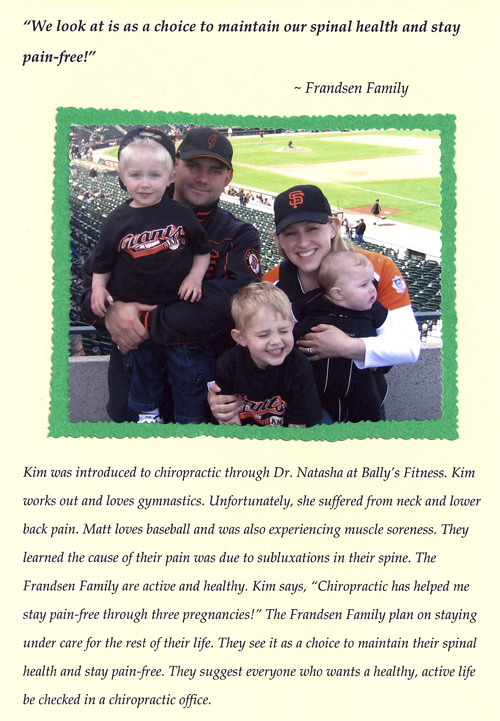 And the benefits didn’t stop there: Chiropractic helped me stay pain free through three pregnancies! We now have regular chiropractic care for the whole family in order to maintain spinal health and stay pain free, and are enthusiastic proponents of the benefits of chiropractic for a healthy active life. I was having a hard time turning my neck. Movement was restricted and painful. A friend referred me to Chiropractic First, and upon receiving a spinal examination, I found out that subluxations were causing my problems. I had my son, Justice, examined as well, and the same subluxations patterns were noted in him. We both went through a course of adjustments, and have seen tremendous results. Besides eliminating the original neck issue, Justice and I are in far better overall health and have far fewer aches and pains. Justice has more energy and better focus and concentration. I have incorporated chiropractic care into my family’s wellness management strategy, and I intend to use chiropractic the rest of my life. I was having serious mid-back pains that were not going away. I had never experienced this problem before and was very concerned. My brother referred me to Chiropractic First and it made all the difference. An x-ray examination indicated a subluxation that was causing my pain. My course of care not only alleviated the back pain, but my overall health has improved. 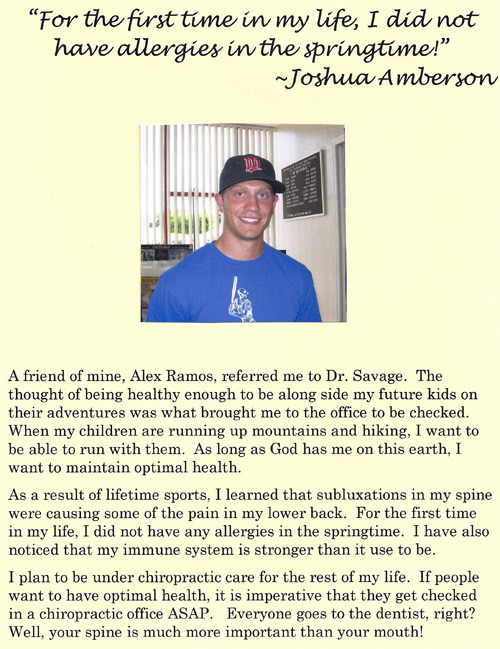 I have also learned a lot and reaped benefits from Chiropractic First’s free workshops. I plan to continue regular chiropractic care for the rest of my life! My wife Barbara was having pain in her legs and I was experiencing severe lower back pain. Our discomfort was getting in the way of the life that we enjoy together—golf, motorcycle riding, and general energetic activities. Since we have been under the care of Chiropractic First, the frequency of my back pain has diminished significantly, and Barbara has almost no pain in her legs. Not only that, she has a lot more energy and is generally feeling great! We have seen so many improvements in our health since our first visit to Chiropractic First, and we now understand that chiropractic is for more than just pain relief. We are including chiropractic regularly in our lives, and encourage anyone concerned about their long term health to do the same. If you want to find out if chiropractic care can help you or your family, simply call our Campbell chiropractic office today!